Ukulele master Joel Jacques will guide you through your very first steps on how to learn to play the Ukulele. Joel is originally from Saskatchewan, Canada and lives in Ottawa, from where he leads the Bytown Ukulele Group (BUG) helping hundreds of people during the last 10 years with live workshops, classes, jams and private lessons. Joel has developed this course on Ukulele Basics – 101, to cover most of the topis that arise first when somebody decides to start learning the ukulele. The course is a series of videos where Joel explains with detail various aspects of the instrument and techniques to kickstart your learning. The course is divided in 6 lessons and 2 songs. Each lesson discusses topics like notes of the open strings, mnemonics, sizes, left and right hand position, down and upwards strumming, chords and diagrams, notes, melodies, and dives directly into two easy songs for you to play along with the teacher. The first song is Eleanor Rigby, which is played in F, and the second song is a Medley with three songs from the 50’s, played in C. Be sure to have your Ukulele at hand when you’re watching the videos, because you’ll be playing right from the start! 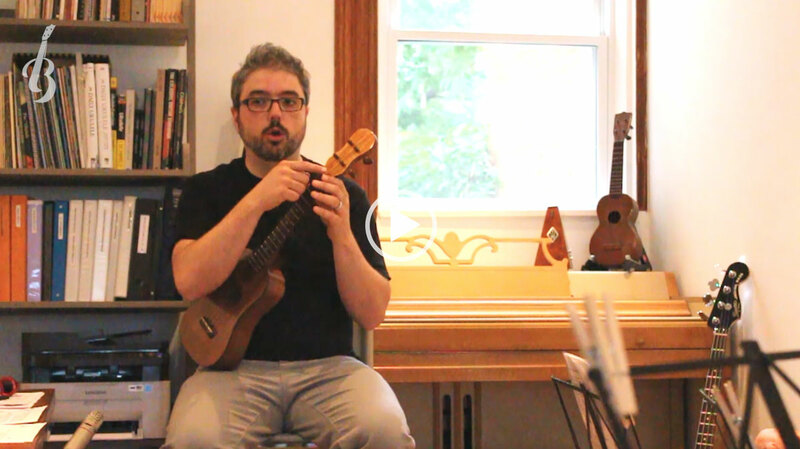 Teacher Joel Jacques covers the various topics for beginner Ukulele players.